I’ve been putting off buying an Instant Pot for at least two years, because I honestly thought it was some dumb craze. Like fidget spinners. However, these things don’t seem to be going anywhere and readers keep asking me for Instant Pot recipes… so I bit the bullet and finally bought one. But the biggest question is, should YOU buy an Instant Pot? 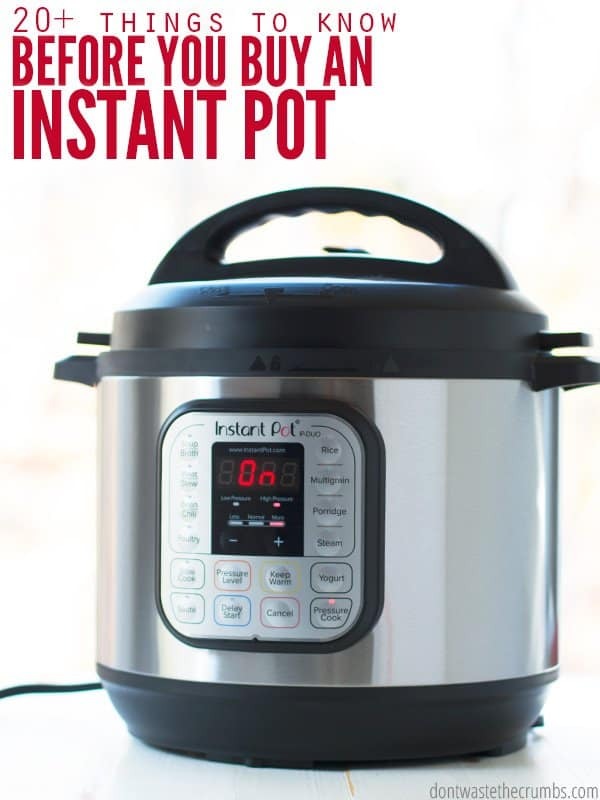 I had lots of thoughts going through my head as I used my Instant Pot for the first time, and since many of you either A) are thinking about getting one on Black Friday, or B) already have one, I wanted to share my honest thoughts on the Instant Pot. Most people think the Instant Pot is a pressure cooker. Which is mostly true. Technically though, the Instant Pot is an electric pressure cooker that is ALSO capable of performing the functions of a slow cooker, pressure cooking, rice cooker and yogurt maker. It can also saute, steam and warm your food too. Basically, it’s the one kitchen appliance that can replace MANY of your other kitchen cooking appliances. I honestly didn’t know this, but the Instant Pot isn’t “instant.” Pressure has to build inside before the appliance actually starts cooking, and then the pressure has to come back down too once the set cooking time has ended. For example, when I made spaghetti squash last week, it took about 10 minutes to come to pressure, then 7 minutes to cook, plus another 4 minutes to release the pressure using the quick pressure release (using the natural pressure release would have taken about 10 minutes). So while the recipe says 7 minutes, it really took 21 – 27 minutes from start to finish. 2. The size of the Instant Pot matters. For safety reasons (and so it operates correctly), the Instant Pot should be filled no more than 2/3 full. That means if you buy the 6 quart Instant Pot (which is the most popular), you can only safely put 3 1/2 quarts of food inside. If you buy the 8 quart Instant Pot, you can put 6 quarts of food inside. Maybe not, but I know that one batch of chicken stock in my slow cooker gives me a gallon worth of stock. There’s no way I’d get that if I had the 6 quart Instant Pot. Which means I have to make multiple batches of stock just to get the same yield. Is that a deal breaker if you can only afford the 6 quart Instant Pot (Which, by the way is regularly priced around $97 on Amazon, and is often on sale for $69 during Black Friday)? Absolutely not, but it is something to consider. The Instant Pot can make chicken stock in 30 minutes (or about an hour when you include the coming to pressure and pressure releasing), so I can easily make a gallon of stock in the same time frame as my slow cooker would. But it does mean more work on my end of emptying and re-filling. Just something to consider when you’re choosing a size. In all my days and weeks of researching, those were the two biggest takeaways I had. Although truly, I learned so much more and I simply can’t NOT tell you!! 1. You can saute in your Instant Pot. If your recipe calls for browning first, and then moving to the appliance, you can do that all in the Instant Pot. You easily can go from one function to another with the push of a button. For example, you can saute chicken breast chunks first on saute, then add other ingredients to give your chicken a nice color. 2. The Instant Pot CAN save TONS of time. Ordinarily chicken stock would take 24 hours, dry beans would take 4 hours and a whole frozen chicken would take several hours to thaw, and then an hour to cook. 3. The Instant Pot uses less energy than a slow cooker. The Instant Pot is on for a shorter amount of time, so it uses less power overall. It’s also insulated much better than a slow cooker, which contributes to less heat loss and quicker cooking of food. 4. The Instant Pot doesn’t heat up the house. I live in the South. ‘Nuff said. 5. You can delay the cook start time. This is probably the biggest “pro” over a slow cooker, meaning you can set the cook time AND the start time. For example, if you want hot soup when you come home but don’t want mushy vegetables, you can set the recipe to start at 4pm. It’ll come to pressure, cook for the time you specify and release pressure naturally. You come home to soup that just finished cooking with perfectly al dente vegetables. 6. You don’t have to babysit the Instant Pot. Slow cookers sometimes require you to check to make sure there’s enough liquid, or to see if something is done yet. Cooking on the stove means stirring now and then so you don’t burn whatever you’re cooking. You don’t have to do any of that with the Instant Pot. You can literally walk out the door and leave it be. You’ll come home to dinner done, with no burning, no scorching (because the liquid is gone) and the only stirring you’ll do is right before you serve. 7. The Instant Pot can turn off when it’s done. My slow cooker automatically turns to warm when it’s done, which means my food is still slightly cooking until I manually turn it off. You can turn this “warming” function off on the Instant Pot, so the food doesn’t continue to receive heat. It will stay warm however, since the pot is sealed, but it won’t be “cooking” per se. 8. The flavor is AMAZING! I think it’s how everything stays inside – the ingredients, liquid, aromas – that makes the flavor of foods so concentrated. Everything I’ve made has come out SO GOOD. It’s like good food, on steroids. 9. You don’t have to convert recipes if you have a different sized Instant Pot. 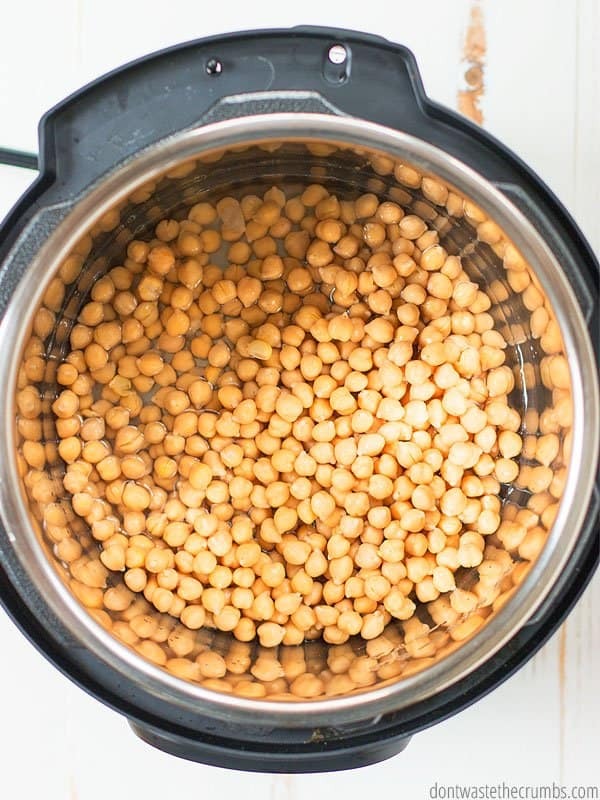 I bought the 8 quart Instant Pot, but most people own the 6 quart (probably because of the price point, but I’d be careful if I were you… read on below in the “size” section). You might think that you have to convert 6 quart recipes to fit in the 8 quart Instant Pot, or the other way around, but you don’t! You just have to be careful that you: A) don’t exceed the max fill line, and B) the ingredients for the recipe will fit in your Instant Pot. 10. The Instant Pot insert is stainless steel. There was a point in time when many slow cooker crocks were made with lead. (By the way, you can test your slow cooker with these easy at-home swabs.) 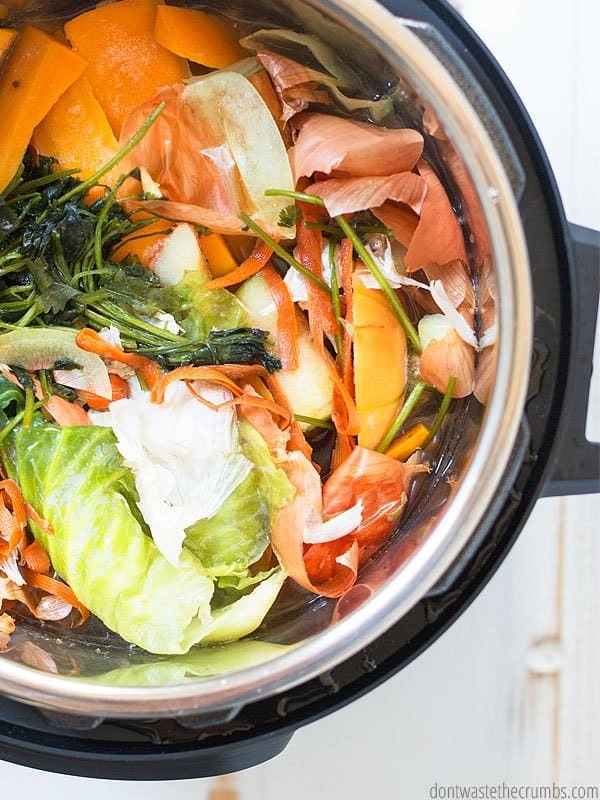 Fortunately, the Instant Pot insert is made with stainless steel, so you don’t have to worry about heavy metals leeching into your food or your family getting sick. And in all fairness, there are a couple downsides to owning an Instant Pot too. 1. While the HOUSE doesn’t smell like whatever you’re cooking, the inner seal of the lid might. I’m running into this now with my seal, since the first few things I made were a frozen whole chicken, chicken stock and then more chicken stock. Basically, the lid of my Instant Pot smells like chicken stock. Fortunately, this hasn’t altered the flavors of anything I’ve made… yet. I’ve heard of some owners who have experienced this “transfer of flavor” if you will, and there’s a great solution for that: buying a second seal! Several vendors on Amazon make “sweet and savory” seals, with the idea being one seal is for sweet things, and the other is for savory. This is a great idea if you plan on using your Instant Pot more than a few times each week AND/OR for more than just dinner. Personally, I plan on using my Instant Pot whenever I can, so I’m earning Amazon gift cards via Swagbucks and saving up to buy a set of colored seals (this set of tri-color three seals is the best deal I’ve found so far). 2. The Instant Pot isn’t ALWAYS faster. 1. You can get a second insert! Sometimes dinner needs a few different components… maybe you’re making kung pao chicken and you’re going to serve it with rice. Or maybe dinner is in one pot AND you’re serving from it… which means you can’t use the Instant Pot for dessert until dinner is over AND the insert is washed. Here’s the solution – get a second insert! You can buy a second insert (available for both the 6 quart and 8 quart sizes) and you’ll be able to make things back to back (to back!). 2. Turn your 8 quart Instant Pot into a serious ONE-POT-COOKS-ALL machine. I was looking for a beef and broccoli recipe and what I found was either people were eating mushy broccoli (because it was put in the pot at the very beginning) OR they were steaming the broccoli separately (which in my mind, seems counterproductive to cooking dinner in the Instant Pot). The fix, is to use a 6 quart insert INSIDE the 8 quart pot. Basically, you put the meat and sauce directly in the 8 quart liner (that comes with the 8 quart Instant Pot) and follow the recipe directions. When it’s done, you put the 6 quart liner ON TOP of the cooked meat, inside the Instant Pot and make steamed broccoli in it using the trivet. The extra few minutes of cooking won’t hurt the meat, and you truly can cook your entire dinner in the Instant Pot! 3. Speed up the “coming to pressure” time by using the saute function. A little expansion of pro tip #1 above. Yes, you can saute in your Instant Pot, but you can also use this function to speed up your “come to pressure” time. Pour any liquids of the recipe in first, hit saute, and let it warm up while you prep the rest of the ingredients. This will reduce the time it takes for the Instant Pot to come to full pressure for your recipe. 4. 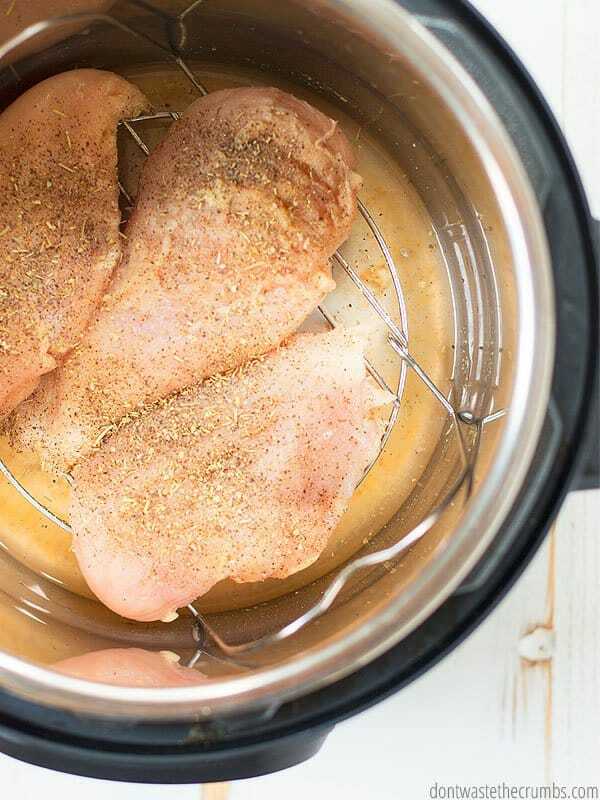 You can use the Instant Pot to reheat food – for real! I was kind of skeptical on how you could reheat food in the Instant Pot at first. I mean, if you’re reheating stew or soup or something else that’s okay to touch the cooking surface, I can see how it would work. But what if it was a casserole… or shredded chicken… wouldn’t that make a mess? Or ruin the leftovers? Solution – steamer insert pans. These pans fit in 5, 6 or 8 quart Instant Pot and allow you to put food inside, while putting water or something else on the outside. The Instant Pot heats the water, and the water reheats your leftovers. Done!! 5. Take it with you on vacation! How much do you spend on eating out when you’re on vacation? Now what if you took that money and invested in an Instant Pot instead? Odds are it would pay for itself in one or two dinners! Instead of going out to eat EVERY night, bring the Instant Pot with you and plan for “one-pot” meals you know your family loves, like pot roast or chili or even a whole chicken. You’ll save money AND invest in a kitchen appliance that will quickly become one of your favorites (tied with the stand mixer and blender, of course!). 6. The Instant Pot comes with built in handles. You know those little “edges” on the lid? If you stick those into the holes inside the handle of the Instant Pot itself, you don’t have to put a (wet) lid on the counter! In all honesty, I personally wouldn’t buy the 6 quart Instant Pot. My slow cooker is 6 quarts and there have been plenty of times where my recipe barely fits (i.e. if I use a larger cut of chuck roast for slow cooker pot roast). If I bought the the 6 quart model, there’s NO WAY that recipe would fit because I could only safely put in 4 quarts worth of food! I’d much rather have a bit of extra space that I don’t need too often, then frequently wishing I had a bigger Instant Pot. You also have to consider the different capabilities of the models… some LUX models have a the cake and egg functions, the DUO has the yogurt, bean/chili and poultry functions, and the SMART model is blue-tooth compatible. Taking it all into consideration – both the functions AND the max 2/3 full aspect – I ended up with the 8 quart DUO 7-in-1 Instant Pot (because of the yogurt setting) and I couldn’t be happier! Sign up for my Instant Pot Basics Challenge HERE! You can learn all my favorite recipes, plus exclusive tips and tricks. Are you in the market for an Instant Pot? Do you own an Instant Pot? Can my fellow IP owners share their favorite tips with the IP shoppers? Leave them in the comments below! When wash my Instant Pot after use I remove the rubber seal. When storing my Instant Pot I put the lid on the Pot upside down and lay seal on top. So far I haven’t had any problems with smell carryover. Great tip – thanks Linda! Thanks Tiffany, was completely unaware of the existence of the Instant Pot which, with it’s versatility, can eliminate many kitchen clutter items… And, your timely post may save me mucho dinero with Black Friday upon us… Happy Thanksgiving to you & yours! Thanks Steve! I’m glad it was helpful!! Happy Thanksgiving! Hi Tiffany – would you say you can get rid of a slow cooker and rice cooker and totally replace them with the Instant Pot? Any other appliances that it totally replaces? I’m considering an Instant Pot, but I don’t want to add yet another small appliance to my kitchen. Thanks! Hi Dani! I’d say yes, with a caveat. I’ve heard scuttlebutt (heresay of heresay) that if you want something done in the slow cooker, to just use a slow cooker. But personally, if/when my slow cooker dies, I’m not replacing it – I’ll just use the IP instead! Without a doubt it can replace a rice cooker, a steamer, and a yogurt maker for sure! I’m so glad you mention that you can get an extra insert! 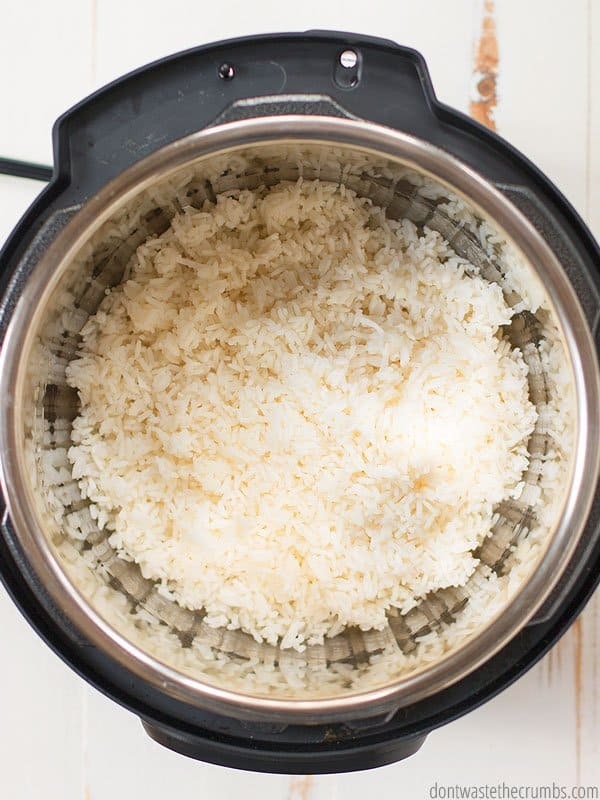 The idea that I like to make a stew or curry AND rice for the same meal made me think I would still want to keep my rice cooker (which I use multiple times a week), I think you just save me a foot of storage in my tiny kitchen…. I love my Instant Pot! I bought mine four years ago, back when they were a cult classic, and I totally felt like a hippie. Now I’m a trend setter! Lol! Mine has easily been my most used appliance, and I pull it out several times a week. You’ve hit many of the big items. I will add that if you out a dishcloth over the vent during a quick release you can safely catch most of the steam coming out of the vent. I love the pressure cooker as much as anything for its versatility. Soups and meats are what it’s famous for, but I’ve also had miraculously success with hard boiled eggs, cheesecake, and squash. (Pie pumpkins turn to mush in less than fifteen minutes under pressure!) Also, while the IP is great for forget-about-it cooking, you can do more precise cooking much faster in a stove top. Instant release is less than two minutes under running water, so I can have black beans and rice from dry to on the table in a literal thirty minutes. I cooked two corned beef briskets the exact same size, one in the IP and one in a stove top, and the stove top won by two hours. In short, I love and use both, and if you are at all interested in a pressure cooker, GET IT! Great feedback Julie the Trendsetter 😉 Thank you!!! You said the stove top method won by 2 hours. Does that mean the stove top method cooked 2 hours faster than the IP? I think she means a stove-top pressure cooker. Thanks for such a thorough review. I keep going back and forth about getting one. They make them seem like such a life saver, but there are always pros and cons. I don’t have a ton of kitchen space, so mine would be in the basement with my Kitchen Aid. I would just be dragging it up and down the stairs. I will keep thinking about it. Thanks again for an honest review. I live in a 5th wheel with 3 children and my sweet hubby. With that said there was no way I was going to follow the crowd and buy and Instant Pot. What a bunch of Hooey I thought. I rolled my eyes when my daughter bought one. She had previously purchased a multi cooker at her local thrift store. So she offered it to me. My first thought was where am I going to put it. Alas I sucked it up took it. Just to prove her wrong mind you. Her husband tried to use it and burned rice. So of course rice was my first choice. It was perfect. Second attempt late evening 3 starving children. Best choice mac and cheese. Amazingly easy, kids loved it. I have used it almost every night since. Hubby is happy. He hates slow cookers. Remember when I began I said I lived in and RV which is always a no space issue. This little goodie my daughter paid 12.99 for btw. Sits on my beautiful little apartment sized antique stove in my 5th wheel. I made oatmeal just an hour ago my little ones loved it. I made space for mine. I will be buying a new Instant Pot this weekend. It will be invaluable in the summer heat. I think my daughter will roll her eyes lol. Good luck with your decision. I’m def leaning towards getting an Instant Pot. But the 8 qt is HUGE and at 35.6 cm tall — 14 ” — there is no place to put it (except out) in my smallish kitchen. I see now that I can replace my pressure cooker and toss the rice cooker once it’s useful life has ended — next year for sure. That makes this appliance more attractive. So help me out here. How big is that chicken and brisket you’re cooking in the IP? The birds I buy for broth are 1 kg — 2.2 lb. One bird yields about a scant quart of broth. At most I’d buy a 1.5 kg bird (or roast). That’s about 3 lbs. That’s plenty for 3 or 4 meals. You’re not recommending the 6 qt based on feeding how many people at one sitting? I’m just feeding myself. Is that the only issue you see with the smaller IP? Also for those of you who have the Instant Pot and are on Facebook, they have a few different groups that share recipes, tips and hints for using the pot. Pretty interesting. Hi Barbara! In that picture, those are 3 organic chicken breasts. The pot roast I’m referring to is about 3 pounds. I wouldn’t buy the 6 quart FOR ME because yes, I’m feeding 4 people and two will be teenagers in the future. For families of just 1-2, I’d go for the smaller one for sure. In fact, I was just talking with my aunt and mom, both of whom are just feeding 2, and suggested the 6 quart for both of them! I bought my Duo 60 Instant Pot last year on Black Friday, and even my husband loves it! It is used almost every day. One hint to get rid of a smelly seal is to ‘cook’ water with a couple Tbsps of cinnamon mixed in. Ooh, I’m curious – how did the IP replace your Kitchen Aid, food processor, and Vitamix? It’s Thermomix replace Kitchen Aid, vitamix, etc.. This is interesting to hear that an IP works in tandem with your TM. I have a TM and wasn’t sure whether it’d be doubling-up to get an IP… I will now closely consider the IP. Thanks. Funny, my sister was just telling me how much she loves hers! I had thought about getting one a while back (last year, when they seemed to be so trendy), but I just wasn’t sure it would be worth the investment. I keep hearing really good things about them, though! Ooh – nice hack with the dehydrator! What kind do you have? Do you know how hot it gets the yogurt? I like to keep my yogurt below 110F. Thanks! Hi Beth! I haven’t tested myself, but a quick Google search says that the IP keeps the yogurt between 106 – 113 F as it cultures! Hmmm… I’ll go back and look! 2. You can cook pot within pot with six quart pot by using a mixing bowl that fits inside. I have an Instant Pot. Do I still need a stock pot? Or rather, would YOU get a stock pot? They’re really two different pots Cindy. I have both, and although I don’t use my stock pot often, nothing can really replace it. Given the choice, I’d purchase the IP first, then the stock pot later if/when there was a need. My biggest concern with the instant pot is the notoriously bad wrap pressure cookers have for being dangerous. Of course in all honestly I am referring to the bad wrap they had 40 some years ago when they first came out. If yo didn’t allow enough time for pressure release it could cause serious. Injury to the user. Does the instant pot have an idiot light that lets you know what it is safe to open? In a way, yes! There’s a little button that pops up when its under pressure, and pops down when it’s not. You also have to turn another lever (to seal/unseal the pressure) in order to open the pot. So worst case scenario, the button hasn’t gone down and you have to unseal to open the lid… but then steam will immediately start coming out the top and you’ll know you can’t open it yet! I’m a wanna be. I’ve been preparing by saving tons of recipies and organizing them according to beef, chicken, pork, fruits & veggies, etc. also lots of beginner recipie books. Where the hell will I store this thing? I’ve got a small kitchen and not great counter space. I can’t leave it out because my wife will kill me. I may have to keep it in the basement ( or in the middle class f my dining room table, lol) , which means up and down the stairs every time. I need the 8 qt. I got one tonight on Black Friday 2018. I am single but I got the 6 quart ultra based on your recommendation of size. I should be good to go for just me or maybe a friend. Most definitely Rodney – congratulations! I am intrigued, however I have NO recipes and my kitchen is like a puzzle-ABSOLUTELY no room to put this. And my basement is full! I only eat chicken and never make soups or yogurt, so I’m not sure it would be worth it for me. What is your opioin? Hi Karen! It really depends. If you spent any amount of time cooking, over the stove, or even baking, it’s worth considering. You will need a place to store it though, so maybe clear a space first and then revisit! I got rid of my crock pot and rice cooker. I use mine for silly things to avoid heating my kitchen. Baked potatoes, hard-boiled eggs from farm-fresh eggs, beans, forgot to thaw my chicken meals. Don’t know if that helps. You may not need one if you can’t think of ideas to try. I pruchased my 8qt instant pot from a friend who had her slow cooker eoutine down. She couldn’t get into it. Wondering what size to buy. I’m a family of four but I wouldn’t be cooking meat in this. I would be doing beans, squash, soups etc. What size would you recommend? Hi Andrea! Honestly, I’d go for the 8 quart. I cook all of these things and a spaghetti squash *just* fits. I can also finagle 2 acorn squash cut in half, but neither would be possible if I had a 6 quart! I still have a question though, you used 6 QT inner on top of meat with 8Qt pot. Would it be okay to use only 6 Qt Inner if I have to cook less in 8 QT pot. I’m not sure I understand the question Shilpa. You can use a 6 qt pot in an 8 qt pot because the 6 quart is smaller in size. It’s a “cheat” way of cooking pot-in-pot and it doesn’t rely on the amount of food you have in either pot, so long as you can close the lid! Would it be safe to use the 6 qt stainless steel cooking pot in the 8qt instant pot cooker? Not pot in pot. Hi Kreger! I’m not sure, but my gut says the 6 quart inner pot won’t fit for proper cooking in the 8 quart machine.